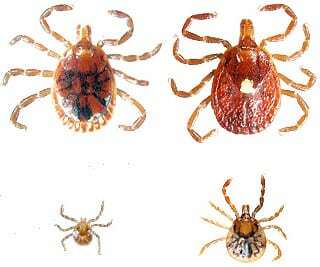 Larval deer ticks are active in August and September but these ticks are pathogen-free. Ticks become infected with pathogens when larvae (or nymphs) take a blood meal from infectious animal hosts. Engorged larvae molt over winter and emerge in May as poppy-seed sized nymphal deer ticks. Please note that most cases of Lyme disease are transmitted from May through July, when nymphal-stage ticks are active. 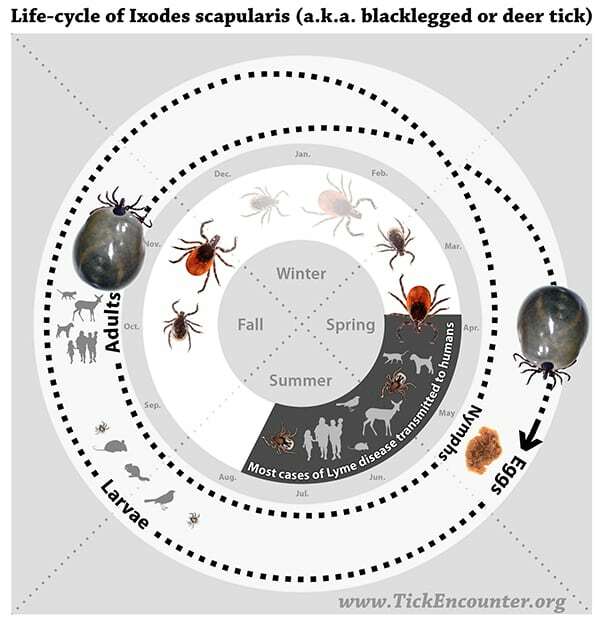 Adult-stage deer ticks become active in October and remain active throughout the winter whenever the ground is not frozen. Blood-en- gorged females survive the winter in the forest leaf litter and begin laying their 1,500 or more eggs around Memorial Day (late May). These eggs hatch in July, and the life-cycle starts again when larvae become active in August. Protect your children, your pets, and yourselves from the potential harm caused by the infestation of ticks. We will implement a tick control program, tailored to your needs. As natives of the East End, we have seen an explosion of Lyme Disease, Erhlichiosis, and other diseases transmitted by ticks to pets and humans. We have been consulting with some of the most dedicated entomologists, scientists and doctors. There is too much misinformation, and we are dedicated to keep you informed of the continuing research and accurate information available. Also, check our blog for a very informative article written by Dr. George P. Dempsey, a notable Doctor on the East End and good friend, dedicated to the study of ticks and tick-borne diseases. Lone Star ticks are found mostly in woodlands with dense undergrowth and around animal resting areas. 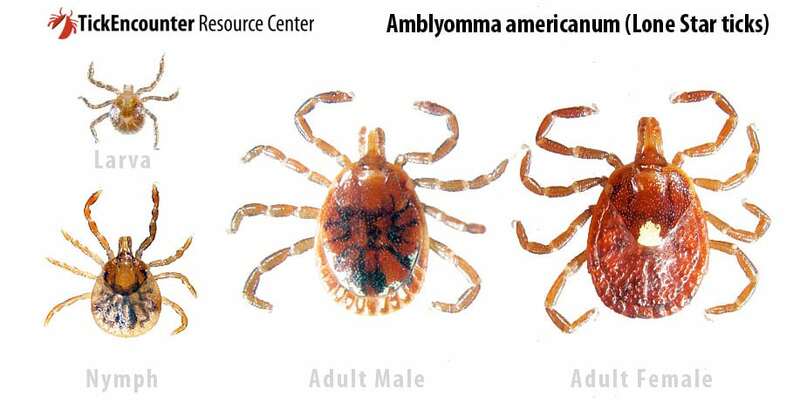 The larvae do not carry disease, but the nymphal and adult stages can transmit the pathogens causing Monocytic Ehrlichiosis, Rocky Mountain Spotted Fever and ‘Stari’ borreliosis. Lone Star ticks are notorious pests, and all stages are aggressive human biters. Adults are active April- late August and can be found questing for larger animals, such as dogs, coyotes, deer, cattle and humans on tall grass in shade or at the tips of low lying branches and twigs. Females are easily recognized by a single white dot in the center of a brown body, with the males having spots or streaks of white around the outer edge of the body. Females require a week to 10 days or more to engorge and can lay 2,500-3,000 eggs. Nymphs are active May- early August, and can be found questing for deer, coyotes, raccoons, squirrels, turkeys and some birds as well as cats, dogs and humans. Where abundant, nymphs seemingly swarm up pant legs and can become attached in less than 10 minutes. Nymphs typically take 5-6 days to become replete, and once fully engorged, they fall off of the host into the leaf litter, where they molt into adults. Larvae are active July- late September and can be found questing for a wide variety of animals, including cats, dogs, deer, coyotes, raccoons, squirrels, turkeys, and some small birds. After feeding for around 4 days, they drop off of the host and bury themselves in the leaf litter, where they molt into nymphs.